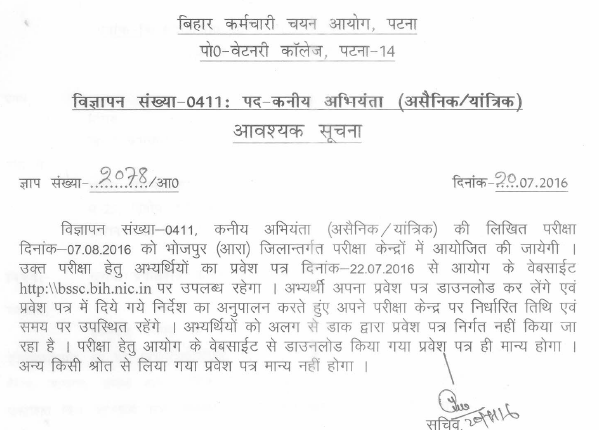 Bihar Staff Selection Commission (BSSC) will organize Junior Engineer Examination on 07 August 2016. The test is to be held as a part of this Kaniya Abhiyanta recruitment's selection process. 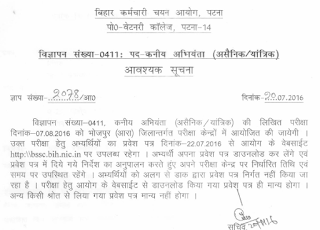 Now BSSC JE Exam Admit card had been released online. You can download them from below given link by entering your roll no. and date of birth. Bihar Staff Selection Commission is going to conduct written exam for JE / Kaniya Abhiyanta posts on 07.08.2016 (Sunday). For that, admit card are available for download now. Candidates can download BSSC JE admit cards from here via the official website http://je.bsscpatna.com/. The test will be held at various centres in Bhojpur (Aara) district. In order to download the admit card for BSSC JE exam, just click on above link and on next page, submit your roll no. and select date of birth. Your BSSC JE Admit card 2016 will be shown to you after the submission of details.